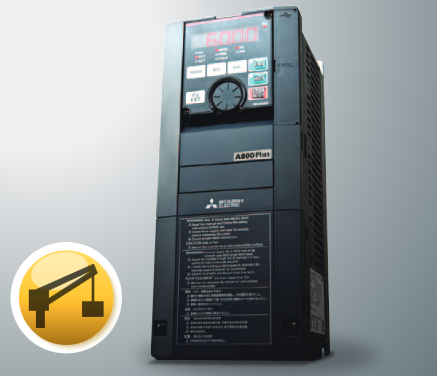 Leading variable speed drive producer Mitsubishi Electric has added a vibration resistant VSD crane application model to its FR-A800 Plus inverter drive series. Further, the enhanced vibration resistant VDS are also suitable for a wide range of applications where high vibrations are experienced. Furthermore, other uses include tunnel boring machines and marine deck cranes. Called FR-A800-CRN, the vibration resistant VSDs offer many crane specific functions built into the operation software to improve performance and reduce tact times. Additionally, the drive includes several mechanical modifications to counter the effect of high vibrations. They include: adhesives to stabilise large devices on the circuit board; cable connectors with special locking mechanisms, and cable bracing. To prevent short circuit faults on the PCBs due to poor environments, the inverter circuit board coating conforms to IEC60721-3-3 3C2/3S2. Plated conductors are available where the drives require additional environmental protection. Importantly, the service life of the cooling fans and the capacitors is now 10 years, and extendable using the cooling fan on/off control. The Mitsubishi developed anti-sway control technology suppresses the swinging of an object moved by a crane at the time of stopping, even without operator’s input adjustment. This control cuts down the tact time and facilitates efficient operation. The drives also include an automatic light-load detection function to reduce tact times. It operates when moving loads both up and down, facilitating efficient crane operation. The possible operation speed is set automatically according to the load. After starting the inverter, the inverter runs at high speed with a light load. The vibration resistant VSD FR-A800-CRN is suitable for electric deck cranes when used in combination with the recommended noise filter. Whenever in combination, it complies with many marine classifications, including NK, LR, DNV, ABS, BV, CCS, and KR.